The Best of Architecture Collection celebrates the only the delights of architecture in a way that actual architecture simply cannot. Architecture, as opposed to architecture-inspired artwork, has an inherent functionality to it. Even from the first record of architecture – a treatise called DeArchitura – The 3 fundamentals of architecture as firmness, commodity, and delight. “Firmness” and “commodity” are the way that the building actually functions; they are the building’s structural capacity and functional capacity. Art of architecture pays homage to the delightful and beautiful aspects of architecture. It strips a building of its traditional functions and allows it to exists singularly as an aesthetic expression. Throughout the collection, skyscrapers are no longer workplaces, but modern marvels. Houses step out of the fold of routine and reconnect with their inherent beauty. Staircases are no longer a means to an end, but a dramatic, winding spectacle. 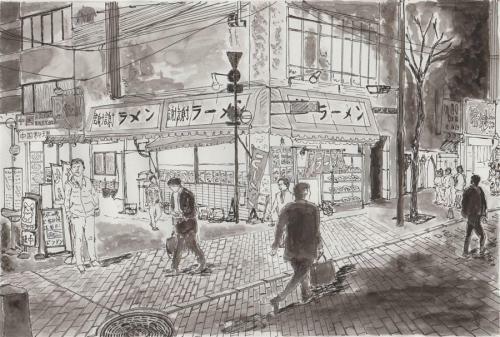 Orlando Marin-Lopez’s small study in ink shows the nightlife of a Tokyo city street with a narratological penchant for detail. The ink pervades the page, illuminating not just the characters, but also the setting itself. Invoking the same sensation of imagery as in an amply-detailed novel, Orlando imbues the traditional architecture with an added layer of intrigue and character showing the way that architecture can cultivate a setting for narrative. 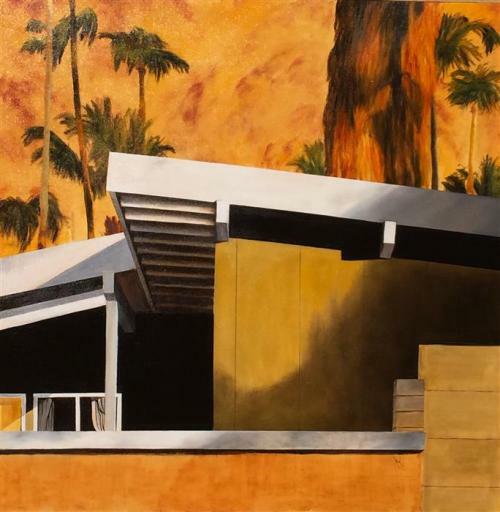 Just as mid-century architecture falls somewhere in between traditional and modern architecture, the house that Mandy Main depicts in Mid Century Modern VI falls somewhere between a natural realm and a manmade realm. 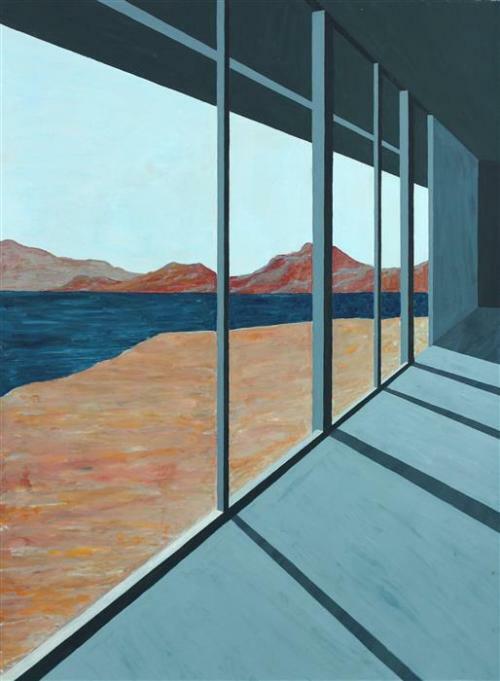 Both architecture and landscape figure strongly and cohesively throughout the painting. They are stratified (background and foreground) and yet unified. With color, the browns, yellow, and orange tones of the house rhyme with the same colors in the palm trees and the sky. 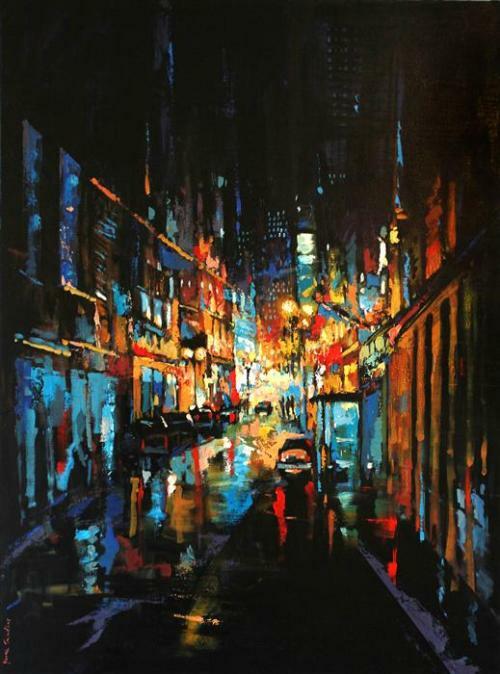 In this painting, the energy of the nightlife accelerates and intensifies as the eye recedes through the canvas. The buildings that Yuvak Tuladhar portrays become alive with the city’s nightlife. 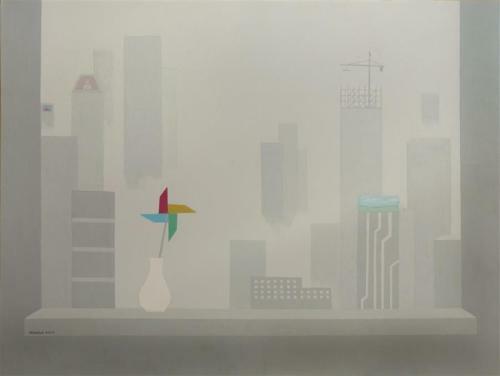 The architecture contains and directs the scene, allowing the eye to track down the picture plane. The reflection of the lights in the rainy street, twin the glow with an abstracted, upside-down replica in color and shape. The effect is a reminder that even when people are not around, architecture has a shining ability enliven and animate scene. See all of the pieces in the “Best Of Architecture” collection on UGallery!